Personal care can include helping Clients get in and out of bed, bathing, personal hygiene and grooming, make-up application, oral and dental care, shaving, and hair care, certified nail and foot care, getting dressed and putting on shoes. For many clients, feeling good begins with looking their best. 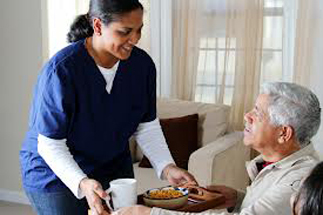 Our Caregivers can assist Clients with light housekeeping and cleaning duties, such as bed making, dusting, sweeping and vacuuming, kitchen cleaning and dish washing, laundry and linen changes, bathroom cleaning, and overall tidying and upkeep of the home. We can assist with putting out garbage, and checking that floors, stairs and hallways remain free of obstacles and tripping hazards. Loss of appetite and the loss of desire to cook for oneself is a common concern for many Clients and their Families, as it can lead to decreased energy and poor health. Our Caregivers are eager to help plan and cook healthy, tasty and nutritious meals. Clients benefit from assistance with grocery shopping, meal planning and preparation, baking and cooking of favourite recipes, monitoring of expired foods in the fridge, freezer or pantry. Many of our Clients may not get out as much as they once did. Maintaining a healthy social life can have a positive effect on many aspects of health and well-being. Our Caregivers can provide much needed social interaction and companionship in a variety of ways, including sharing a hobby, baking cookies, playing cards and games, walks in the neighbourhood, addressing and posting cards and letters, planning outings and visits with friends. Our certified caregivers support our Clients' goal of maintaining independence in any setting: at home, in a support community, in long-term care or during hospital stays. Many Clients are able to maintain their quality of life when provided with the right amount and type of support. Second Family Caregivers help Clients with a wide range of everyday activities so that they can continue to live their lives as safely and independently as possible.